Risotto is one of my favourite things and although not considered very healthy usually, it’s lovely on occasion and doesn’t have to contain handfuls of parmesan (debatable I know..) White rice spikes blood sugar and insulin when consumed on its own, but team it with vegetables and it has much less of an effect. I’ll hold my hands up and say I’m a white rice fiend, I love it, so I’ll find any way to make it that little bit healthier! 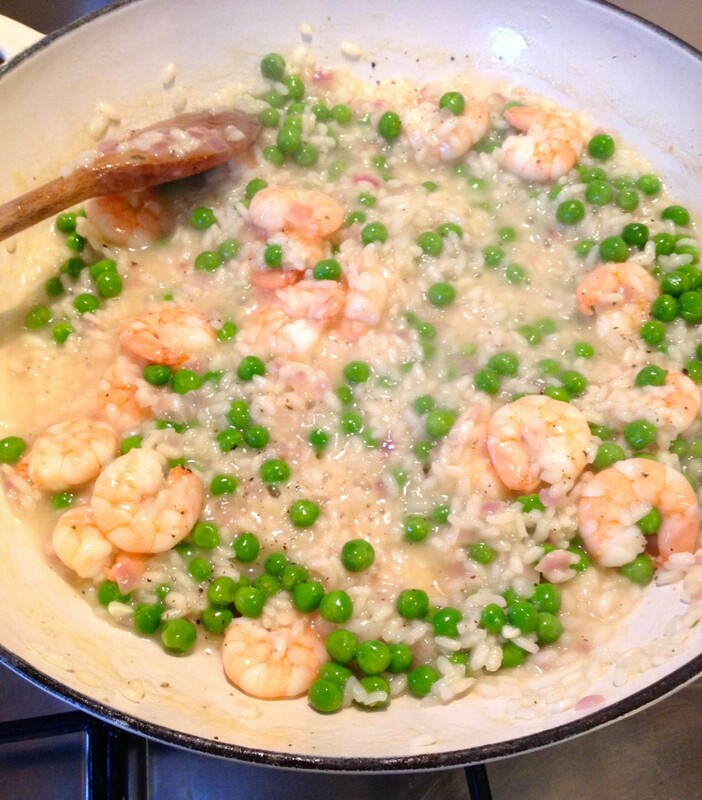 Pea and prawn is a great combination for risotto, especially with loads of parsley. Sweat the onion in a little rapeseed oil over a low heat until soft. Add the garlic and rice and cook gently until the rice is starting to go transparent. Pour in the wine, raise the heat a little and cook off until the liquid is absorbed. Then start adding the stock in small amounts, letting the liquid absorb each time and stirring constantly. Continue for around 15 minutes, never letting the rice stick to the bottom of the pan. Add the prawns and peas in the last 5 minutes of cooking, you may need more or less water. The rice should have a slight bite to it but shouldn’t still be chalky – if it has gone mushy you’ve gone too far! Stir in the parsley and make sure the last of the liquid is absorbed. Grind in some black pepper. At this stage you can stir in some grated parmesan if you like, but it’s lovely without and much healthier! Posted in Recipes and tagged dinner, parsley, peas, prawns, rice, risotto.